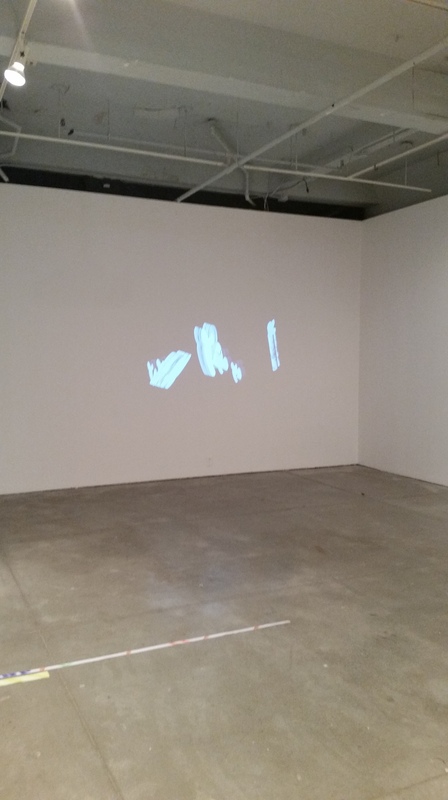 “The quality of a distinct object or body in having an external surface or outline of specific form or figure” (dictionary.com) is a definition, which to me, perfectly describes the dialogue created by the artists in the group show entitled Beginning the Shape, exhibited at the Or Gallery in Vancouver, B.C. from December 6th, 2014 to January 31st, 2015. 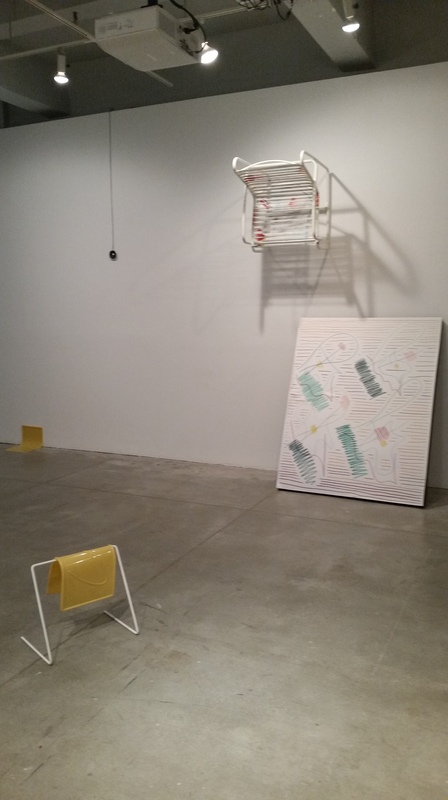 The show was guest curated by recent Emily Carr undergraduate Madison Killo, a move not entirely uncommon for the Or, yet I must admit I did find the overall aesthetic discernibly different than something the gallery usually produces. Perhaps this was due to the pastel colour palate and loose squiggly patterns that inundated the works, features which were the most striking and connective elements of the show. The combination of selected artists, being Maya Beaudry, Scott Kemp, Mel Paget and Kristen Abdai respectively, did seem fitting for the show’s theme of morphogenesis, or in more digestible language, the genesis of cells and the ultimate development of an organism’s shape. The notions of shape, form and space seem to be very trendy in current visual art dialogues, but in this case were curated together as a singular installation, a technique that can be compared to the concept of “art that performs” first discussed in an essay by Judith Barry. With this in consideration, Beginning the Shape was a stimulating exhibition that brought together emerging talent in a contemporary approach to understanding shape and form, but fell short only on the curatorial side, with the resulting dialogue between works less interesting than the forms they were speaking to. Like most successful group shows, the exhibition consisted of a variety of mediums, in this case, sculpture, video projection and sound, thus allowing each artist to perform their own take on morphogenesis through a different material discipline. The single room gallery contained all four artists’ works, which were placed throughout the space seemingly sporadically. The only thing allowing the viewer to navigate which work was which was the specific aesthetic and material consistencies of each artist’s work, which I personally really appreciated because it gave the pieces, and overall show, a sense of character and humor. The sculptures by Maya Beaudry took up the majority of the space due to their larger scale, occupying two walls and a corner, while Mel Paget’s video projection boasted the rear wall all to its self. Throughout the central floor space Scott Kemp’s small – no higher than knee height, but nonetheless intriguing – rubber pieces hung flaccidly on metal racks and against walls. Even smaller, almost unnoticeable speakers amplifying Kristen Abdai’s sound piece lined the upper walls around the gallery. Although the various pieces were of different materials and practices, most of them made sense in the way they conformed to the greater understanding of the show’s theme of creating shape, as well as the larger metaphor of artistic production in relation to producing a physical object with, in this particular case, synthetic materials. As aforementioned, the colour palette and repeated scribbly-gestures had a huge impact on the overall aesthetic of the show, and also served to tie together the more unrelated physical materials into conversation with each other. For example, most of Beaudry’s works were made up of a combination of vinyl prints, various styles of lawn chairs and other similarly pastel-hued and bulky sculptural pieces that varied in both shape and size. When placed in conjunction with Kemp’s buttery yellow rubber mats, they all worked together to make sense compositionally, perhaps due to their shared material similarities. From another viewpoint, Mel Paget’s projection could also be incorporated into this larger composition. The images were reminiscent of an early Microsoft screensaver and involved simple low-resolution shapes that slowly and continuously evolved and morphed into new forms before the viewer’s eyes; the only constant element being the simple yet satisfying shade of soft purple-blue which they were coloured. With this surface visual language, the works were linked together harmoniously, and through further engagement with the pieces, they move toward becoming, as was stated in the curatorial statement, “a singular installation”. Mel Paget. Animation of 3-D Object, 2014. Video Projection. The exhibition’s notion of form assemblage and placing of the self within the art brings to mind an essay by installation artist and essayist Judith Barry entitled “The Space that Art Makes”. She describes how installation art in particular creates a new understanding of the works presence, from the “moment of recognition” (Barry, 47), which is beyond language and representation, but becomes instead about its “ability to function as an event and a vector for thought…it is the work that performs” (Barry, 47). Perhaps it is my interest in the repetitive squiggle gestures of the sculptures and the slow but consistent flow and change of the projected shapes that, when together as a singular installation, give me this sense of the work “performing itself” both within its own material composition, as well as in the way in which it interacts with the viewer and with each other. The underlying feeling of the pieces caught in motion, halfway through a journey up a wall, in mid-change of shape, or the disheartened way in which the rubber mats sag against harder edges, all embody a sense of internal personality. The works practically vibrate with an eagerness to change and morph. The only piece that seemed disjointed from this sense of congruence was Abdai’s sound piece. Perhaps the volume was too low or human hearing grows accustomed to constant and repetitive compositions too quickly, but the piece did not seem dynamic enough to equally participate with the other works. This is quite often the problem when combining more abstract disciplines, such as music, into a show of prominently visual and materially tactile works and expecting an automatic or innate correspondence between it all. With the other works, there was this underlying sense of movement, an impression that the pieces were slinking and scrambling up and along the various spaces of the gallery; static yet vibrating with personality from within. This seemed possible due to their strange material sensibilities (rubber, vinyl, gestural mark- making, slow moving images) in combination with their positioning. In Kemp’s case, rubber hanging off of racks and casually reclined against the wall, while Beaudry perched one of the chairs halfway up the wall, as if caught mid-voyage to the ceiling. In short, it wasn’t that the sound piece was not dynamic, bold or intricate enough to hold one’s attention, but more accurately that it did not seem to speak enough to the shapes and shifting forms of the described nonlinear organism like its more physical counterparts did. Thus for the viewer it became relatively easy to dismiss the significance of its contribution to the installation. Beginning the Shape was put together in hopes of creating a resulting “morphogenesis of a distinct experiential essence” (Killo), combining different practices of art making into one singular installation that spoke to “create a multiplicity through their unification” (Killo). Although I find this discourse very interesting and, as a viewer, could see the result of such intention with the works, the pieces related mostly on a surface aesthetic level, and beyond the obvious gestures implied by the works, a complete understanding was never completely attainable as a collaborative installation. Barry, Judith. “The Space That Art Makes.” INSITE 2005 (2005): 47. Print. Killo, Madison. “Exhibition: Beginning the Shape.” Atom. Or Gallery, 6 Dec. 2014. Web. 23 Feb. 2015. <http://www.orgallery.org/beginning-the-shape&gt;. “shape.” Dictionary.com Unabridged. Random House, Inc. 25 Feb. 2015. <Dictionary.com http://dictionary.reference.com/browse/shape&gt;.